Keith Curle admits the Cobblers have to ‘go back to basics’ as they look to bounce back from Saturday’s crushing 4-0 defeat to Colchester United at the PTS Academy Stadium. Town play their game in hand on second-from-bottom Macclesfield on Tuesday night when they travel to Tranmere Rovers, knowing a win over the Wirral side would see them go 10 points clear of the relegation zone. The Town boss was obviously disappointed by his team’s second-half performance against the U’s, and ahead of the trip to the north west, he admitted: “It is a little bit about going back to basics, and resetting the dial. “We have to again implement people’s roles and responsibilities, and again address the mentality within the changing room. Town face a double road trip this week, as Tuesday’s clash at Tranmere is followed by Saturday’s showdown at leaders Lincoln City, and Curle is looking forward to the games. “We have got a fantastic game on Tuesday night, and then another one on Saturday,” said the Cobblers boss. “They are two great challenges for the team, for the changing room, for myself, the coaching staff and the football club. 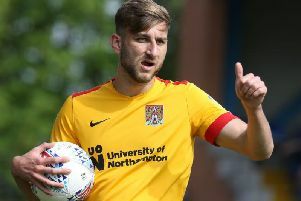 Asked if he was still relaxed about the Cobblers’ position in the league two table, Curle said: “I wouldn’t say relaxed, and I am not content because I want to be top. “But my starting point here was where we were, the changing room is where it is, and this is a building process that doesn’t happen overnight. “The chairman, the stakeholders, the football club, the supporters and the players know this is a work in progress. “Every day is spent improving the players, whether that is technical, tactical, physical or the mental aspect of change. “It is a challenge to change a mentality, and when we do that and change the dynamics from inside the football club, then we will get results.